The realm of the ocean is so unexplored that it almost makes sense that some rumored, but yet unseen, creatures may call this strange blue world home. One of these rumored creatures to exist in the great depths of the ocean is the Ningen. The being is huge, stark white, and vaguely humanoid (in fact, the Japanese characters that represent Ningen means humanoid: 人間). It was first allegedly spotted by a group of Japanese fishermen who were in the Arctic around 2007. Since then, it has only been sporadically seen and reported although it is becoming more and more well known. They seem to largely populate the icy and distant waters of Antarctica. As mentioned above they are quite large, some reports saying up to 30 meters although some reports have been smaller. They are also a bright and obvious white, which attracts the human eye. In addition to their size and color, they are also quite humanoid. They have what appears to be a human-head-shaped head, as well as a short and thick neck. The Ningen also seems to have shoulders and two large, long and perhaps unjointed arms. The arms typically end in long fins that are reminiscent of hands, and some reports go as far as to say they have five fingers on the hand (which would seem to be a not very good advantage for swimming and swift movement). These are the main humanoid features, as it appears its torso and rest of its body ends in a tapering body ending in a fin. In regards to the fact, although it appears human-like, it is flat and smooth and doesn’t seem to have any discernible features besides two very large eyes (which are typically linked to creatures who inhabit the deep ocean) and a long, thin slit for a mouth. Although it is shocking that something this big could go unnoticed or unremarked, one should consider the giant squid. The first images ever of giant live squid were discovered by researchers in Japan in 2004, and the first live squid found was not brought to the surface until 2006. Is it possible this strange Ningen isn’t a new creature, but a different kind of giant squid or a deformed giant squid? Like the Ningen, Giant Squids are quite elusive, have massive eyes, barely ever break the surface, have massive bodies, and carcasses of giant squids have been found in all of the world’s oceans, even the Antarctic. In fact, there a specific squid that is called the ‘Colossal’ Squid (M. hamiltoni) that has been found in the Antarctic and the largest specimen ever caught, also the largest cephalopod ever caught alive was also in the Ross Sea in the Antarctic. Other theories believe that the Ningen may be simple pareidolia, which is the perception of recognizable shapes in a random pattern. Perhaps the Ningen sightings are a result of human-shaped icebergs? Or, is there a brand new creature that looks strangely human-like trolling the deep? The above image is from Wikimedia commons from AWeith and this file is licensed under the Creative Commons Attribution-Share Alike 4.0. It was a seemingly average day in Van Meter, Iowa on September 29th, 1903. However, the creature known as the Van Meter Visitor would radically alter this average day. The nights of Tuesday, Sept 29th through October 3rd would be filled with terror, shock, and the sound of giant wings flapping in the sky. The Van Meter Visitor appeared out of, apparently, nowhere. Which is surprising, considering its size. It was reported by dozens of witnesses as roughly an 8 foot-tall half-man-half-winged-beast. It had a horn on its head that, at the tip, shot out a blinding and disorienting white light. To me, it sounds similar to the Jersey Devil but bigger, especially the detail of leathery wings. Although, unlike the Jersey Devil, the Van Meter Visitor seems to have a development that specifically works to disorient and confuse people that see it. Some people even said the light temporarily blinded them. The first event took place downtown, right in the heard of the city’s business district which meant many credible witnesses and town pillars came out in defense of seeing the Van Meter Visitor. It’s the first appearance, though, happened at 1am. U.G. Griffith was the first person, it is believed, to have experienced the Van Meter Visitor. Initially, he thought it was a spotlight moving around a rooftop and woke up annoyed and ready to confront whoever was behind it. When he approached the source of the light, something huge jumped to a different rooftop all the way across the street and then completely disappeared into the night. The very next night around the same time, Dr. Alcott, the town doctor was fast asleep in a room above his office. Like Griffith, he was also was awoken by a bright light shining into his window. And, also like Griffith, he rushed out to confront whoever was shining that light. Gun in hand, he was shocked to discover the Van Meter Visitor, which he described as a humanoid with bat-like wings. He reported that he also saw that the blinding light came from a blunt horn in the creature’s forehead. Shocked, but still well in control of his faculties, he attempted to shoot the creature down a shocking five times. After firing, he noticed that there was absolutely no effect on the creature and fled back into his home. Because all bad things come in threes, there is one more experience to go over. Once again the Van Meter Visitor made his nightly rounds, this time shining his onto a watchful Clarence Dunn. By this time and after two encounters by trusted people in the community rumors were just beginning to swirl. Dunn had heard about Dr. Alcott’s experiences (although it is not clear if he had heard about Griffith’s) and decided to keep watch through the night. He posted up in the bank and brought his shotgun along to keep him company, should the Visitor stop by. Although, he still believed clever burglars were behind the strange sightings. Like the other two men, at around 1am the Van Meter Visitor made himself known. Unlike the other experiences though, this time Dunn said he heard a ‘strangling noise’ outside his home and that is what pushed him to investigate, not a light shining in the window. Almost instantaneously, as he moved to open the door he was hit in close range in the face through the window with the blinding light of the Van Meter Visitor. When the light briefly let up, according to The Bigfoot Diaries interview with the authors of the Van Meter Visitor, “some kind of great from behind the light.” Dunn, instinctively, fired his shotgun at the mysterious being, right through the bank’s front window. Like the shots by Dr. Alcott, it had no effect on the Visitor. The next morning outside of the bank he saw several sets of three-toed footprints (another call back to the Jersey Devil?) and said he made plaster casts of them, although they have never been found. More sightings were reported throughout the three days. This includes O.V. White, the owner of a local hardware store, who saw the monster asleep on a telephone pole and tried to shoot it. Interestingly, instead of using his light or making a strangling noise, the Van Meter Visitor expressed his annoyance by releasing a ‘terrible smell’ towards White. Mr. White’s neighbor, Sidney Gregg, also saw the creature at the same time dismount the pole and then fly through town, apparently heading towards the old coal mine on the outskirts of town. Most interestingly and semi-related to the Mothman, rather than the Jersey Devil, is the experience at the mine. Fed up after three days of their town being terrorized at sundown, several people from Van Meter geared up and headed towards the mines, where Sidney had said the creature had flown to the previous day. By this time, strange noises were being reported coming from the abandoned coal mines. A local allegedly described these sounds as, “though Satan and a regiment of imps were coming forth for a battle.” When the men got to the mines, they found the Van Meter Visitor wasn’t alone. Instead, it was accompanied by a second creature (which was spotted emerging from the mine and taking off into the night). Before they could confront either creature, they both had fled. The men decided to wait to see if the creatures returned. They eventually did and the crowd opened fire on the creatures. Apparently, they didn’t think very much of the previous attempts to bring down the Van Meter Visitor with the gunshot. Once again, despite the increased numbers and firepower, they were still shocked when the creatures were completely immune to their firepower. Unsure of what to do next or how to handle these creatures that could not be easily brought down, they decided to simply brick up the abandoned mines to ensure that those things could never see the light of day again. Perhaps there was another way out and perhaps they flew away into the night, but they were never seen again in Van Meter. Thanks to Ander S for the suggestion! One of the earliest stories is from R.K. Lloyd and his wife in 1938. It scurried across the road in front of them and they believed, at first glance, it was a monkey scurrying. However, they soon realized it was a gigantic spider. However, locals have reported seeing this strange creature long before the Lloyds saw them in 1938. In addition to their grotesque size, they are brown in coloring (and said to be darker and darker the older they get) and have a large purple mark on their abdomens. They are said to live similar to the much smaller trapdoor spider (in burrows at ground level). It is not just their size that makes them dangerous but also the way they hunt. As mentioned above they are able to hunt large prey (or, at least, larger than other spiders’ prey) and they d this by creating intricate and almost invisible webs. These webs are constructed between two trees with a ‘trip line’ across them to alert the spiders when an animal is about to be caught. When the animal hits the trip line they are forced into the web and pounced upon by the J’ba Fofi. Many locals say that the J’ba Fofi used to be much more prevalent and feared in the area however continued human encroachment, development, and expanse has led them to be seen less and less. So, why haven’t we seen any? Well, Giant invertebrates were once a reality. So, were the locals seeing the last of a long-preserved but dying breed? Or, had the stories ben passed down for so many generations that perhaps, just maybe, a human did once lay eyes on the J’ba Fofi? Other sources believe that the locals weren’t seeing spiders at all but very large land crabs, similar to the frightfully large coconut crabs. Perhaps the J’ba Fofi is a land crab who, like the coconut crab, burrow underground. Thanks to John G. for the suggestion! The above image is unrelated to the story and is by Flickr user patchattack, entitled web. It is licensed under cc-by-sa 2.0.! Tatzelwurms are creatures of the Alps. Because the Alps criss-cross so many countries, you may also know these strange cryptids by a different name like lindwurm, arassas, or daazelwurm.Tatzelwurms, also known as claw worms, are a strange mix of two creature - a cat and a snake. It makes its home in the mountains and preys on animals and, in some cases, humans. According to witnesses and Alpine folklore, Tatzelwurms are typically about two feet at the smallest but can grow up to a massive six feet. The cat-snake takes on the qualities of the snake when it comes to its body. Although it has front legs (clawed), it has no hind legs. Its body is covered in delicate scales and is bereft of hair. Its head and face is where its cat-like qualities come through. It has a large head with two, large eyes. In addition to its powerful body and clawed front legs, it is also able to protect itself by spewing poisonous fumes. Although the creature has been seen throughout the Alps in Spain, France, and Germany most of the sightings are located in Austria and Switzerland. One of the most infamous experiences with the Tatzelwurm comes from a Swiss photographer named Balkin. While in Meiringen, Switzerland in the Alps, Balkin decided to snap a photo of a logo. However, while setting up his shot the log moved. However, it was later believed that Balkin had faked the photo. Interestingly enough there has been news of the Tatzelwurm into the 21st century. In 2000 a strange skeleton was sent by a local college and then donated, along with a large donation, to the Geneva Institute. Some scientists (rumors only) that believed it to be the first legitimate example of the Alpine Tatzelwurm. The original owner and donator never came forward and the law firm that handled the transaction, Gunterhaus Ltd. refuses to divulge any information. There are some interesting theories about what the Tatzelwurm is (if it is not real animal). One of my favorites is that it is a salamander. Perhaps, long ago, a giant salamander roamed the land. This wouldn’t be completely unheard of. In fact, there is a Japanese Giant Salamander that can grow up to 5ft, has a long, thick body and has front claws (however, it also does have back legs although they are smaller than the front legs). This sounds a lot like Balkin and countless others in the Alps have claimed to see. Perhaps it was a leftover ancient creature that was all but dead when humans began inhabiting the Alps and left only a few specimens. Illustration (fig. X) depicting a mythical "Alpine dragon" from Ouresiphoítes helveticus, sive Itinera per Helvetiæ alpinas regiones facta..., 1723, by Johann Jakob Scheuchzer (1672-1733), illustration to p. 385.It was a four-footed dragon with a catlike face and a crest (German: Haarbusch) on top, and a tail 3 ells long. Encountered by Andreas Roduner ca. 1660 on Wangserberger mountain.It is only one of many unspecified dragons (draco) of the Swiss Alps treated in the original sources (J. J. Wagner and Scheuchzer), but Meurger & Gagnon 1988, p. 266 counts it as an example of Stollenwurm/Tatzelwurm. You’ve heard of Yeti and Bigfoot...but what about Scotland’s take on a strange, hairy, large creature that craves solitude? Surprisingly there is one and he inhabits Scotland’s Ben Macdui mountain. His name, Am Fear Liath Mòr is his name, but he is also called the Fear Liath or the Big Grey Man. He is typically described as being very large (roughly 8-10 feet tall), his body is covered in short, coarse hair, and he has very broad shoulders. It is also reported that the creature is known to gesticulate wildly with long, ungainly arms. He is usually seen at the summit of Ben Macdui in the Cairngorm mountain, but there have been several sightings off the very top as well. At a meeting of the Cairngorm Club in 1925, he told the strange tale of his experience at Ben Macdui over 20 years ago, in 1891. One of these letters from Dr. A.M. Kellas, who shared his experience on Ben Macdui with his brother. According to ellas, his brother and him had just reached the summit when, shortly after, they saw a large figure making its way towards them. Frightened, even with the distance, the brothers fled when it went into a dip in the summit and made their way down, not wanting to bump into the strange, large creature again. In a way, this creature seems more similar to the Yeti than Bigfoot in its intents. Like the Yeti, it inhabits a specific location and does not seem to completely hide themselves from humans. In fact, they may even take an interest in keeping humans alive (perhaps, in the mist, the Fear Liath was making sure the Professor was alright). However, one thing that seems to be unique about Fear Liath, and, perhaps most sad, is the common report of “overwhelmingly negative energy, feelings of despair and fear to the point of those experiencing these feelings wanting to commit suicide.” Some even report a fleeting desire to jump off a cliff close by to many of the sightings called Lairg Ghru Pass. Although the creature, in reports, does not seem to do anything harmful or aggressive towards humans it creates an unshakable sense of dread that is enough to make climbers flee for their lives back down the mountainside. Some scientists tackled this strange myth and came to an interesting conclusion, according to Historic Mysteries, “There is a phenomenon researchers call a Brocken Spectre, Brocken Bow or Mountain Spectre. It is a trick of light that plays on the eye which makes a person believe an enormous shadow creature is facing the observer. This optical illusion results when a projection of the observer’s own shadow reflects onto a misty mountainside or cloud bank opposite the sun.” Although, it does appear as if this has been tested or recreated on Ben Macdui. So, perhaps the Big Grey Man is up there waiting for you to come across him. The above is an image of the "Roof of Scotland. Twinned with Mars. The barren lands around the head of the Allt a' Choire Mor just north of the summit of Ben MacDui. The usual route up passes through here, a tricky navigational challenge on a tourist hill. There is a higher place, but it's the area of very high ground that impresses here." taken by Richard Webb and is liscensed under Creative Commons 2.0 Generic. Despite its cutesy name, the Bunyip is a beast to be feared. It makes its home primarily in the creeks and swamps of Australia. It is amphibious and has been described in a variety of ways, although the consensus is it has a round head, long neck, and a body that looks something like a cross between an ox and a manatee. A report in the Wagga Advocate in 1872 said ‘it was half as long as a retriever dog... its body was jet black.’ You can tell one is near if you hear "booming or roaring noises" and you should pay heed to these noises, as they are notorious for having a taste for human flesh...especially for women and children. Bunyips appear to be nocturnal and does its best work creeping up on animals and humans in the dark. For this reason, Aboriginal tribes were understandably frightened to go near any waterholes, wells, swamps, and waterbeds after dark. Long before Europeans ever set foot on Australia, the Aboriginal tribes told tales of the Bunyip. Bill Wannan, a researcher of Australian folkore told the Murray River team, which specializes in tourism, "that old Aborigines told him that the ‘bunyips devoured humans, coming up on them in silence and when least expected." When Europeans began to land and make contact with Aboriginal tribes they heard tell of the Bunyip. It is believed that Europeans might have, originally, deeply feared the Bunyip. Why? As Folklore Thursday succintly puts it, "Imagine [the First Fleet of British people, half of which were convicts] first reactions to seeing a kangaroo, an echidna or a platypus? No wonder the tales of the Bunyip were accepted by the settlers." After seeing so many strange creature, who were they to take a skeptic route when it came to the Bunyip. As noted, eye-witness accounts tend to be spotty regarding a similar description bu they can all agree on one thing...whatever they saw terrified them. A newspaper article from 1845 reports, "The Bunyip, then, is represented as uniting the characteristics of a bird and of an alligator. It has a head resembling an emu, with a long bill, at the extremity of which is a transverse projection on each side, with serrated edges like the bone of the stingray. Its body and legs partake of the nature of the alligator. The hind legs are remarkably thick and strong, and the forelegs are much longer, but still of great strength. The extremities are furnished with long claws, but the (natives) say its usual method of killing its prey is by hugging it to death. When in the water it swims like a frog, and when on shore it walks on its hind legs with its head erect, in which position it measures twelve or thirteen feet in height." The 1800s seemed to be the most popular time for reported Bunyip sightings and a “Bunyip skull” was discovered in 1846 and put on display. However, it was later found out to be a hoax and was likely the skull of a deformed horse or cow. What are some of the more skeptic approaches to the Bunyip? Well, it might be the "rare appearance of fugitive seals far upstream" and the cry itself might be "that of the bittern marsh bird." Others claim the Bunyip may be an old "cultural memory of the diproodon passed down from the times when mega fauna roamed the Australian landscape." Diprotodons resembled giant wombats and was over three meters long. It might also simply be a cautionary tale to avoid midnight jaunts around swamps one could easily fall and drown in. Real or not, I think an Australian swamp is one of the last places I'd like to be. The above image is public domain. One of the most interesting types of cryptids to dive into, at least for me, are ocean or water-dwelling cryptids. Mostly because some of these cryptids turn out to be actual animals that exist today, such as the giant squid or the goblin shark. 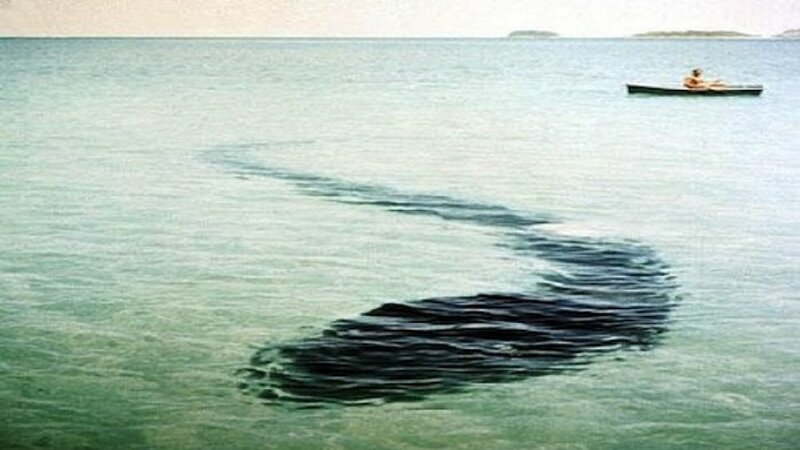 One of the most infamous, photo-captured sea cryptids is the Hook Island Sea Mosnter from 1965. First, let's start with a physical description. It is a gigantic sea monster that resembles a terrifyingly ginormous tadpole. It was spotted in Stonehaven Bay, Hook Island, Queensland. Robert Le Serrec, who had a run-in with the monster, said he saw it with his family and his ship-hand in December, 1964. Robert Le Serrec, as you might have guessed, was a frenchman. His family had recently purchased a motorboat and had decided to stay on the island for several months. The family was crossing Stonehaven bay on December the 12th on their motorboat. While on the boat, Robert’s wife noticed a strange object on the bottom of the lagoon. How strange? Well, it was massive, 30ft long, and shaped like a tadpole. The family started snapping pictures, and Le Serrec's first mate, de Jong, eventually summoned up enough courage to jump in the water with the intent of filming the creature. Initially, they believed the 75-80ft monster to be dead. But, they were wrong. When Le Serrec got closer and began filming, the serpent opened its mouth and started moving towards them. Frightened out of their minds, they returned to the safety of their boat. When they got settled back aboard the boat, the creature had fled. Unsurprisingly, many tried to instantly debunk this theory. Claiming it was somehow photoshopped (despite being from 1960s) or otherwise manipulated. Some even claim that it is likely that the picture is just a clever angle on a large school of fish. However, this is vaguely impossible because of how straight the lines are in the pictures. Those who "want to believe" but find a rational explanation also guessed that the creature could be a huge swamp eel, from the Synbranchidae family. But...these types of eels rarely grow larger than 150cm. Others guessed that it might be a monster-shaped sheet of plastic, weighed down to create the shape. The exhaustive and well-researched Scientific American article on this, by Darren Naish, concludes that it was undoubtedly a hoax. "in 1959, Le Serrec had tried to get a group together on an expedition that would prove “financially fruitful”, and that he had “another thing in reserve which will bring in a lot of money… it’s to do with the sea-serpent” (Heuvelmans 1968, p. 534). Incidentally, the film supposedly taken of the creature revealed nothing." -All Hook Island sea monster pictures were taken from the Scientific American article, as cited above. 1959 was, no doubt, an interesting year, even for cryptozoology. As a fan of cryptozoology myself I often think I have read all the best stories on these creatures, their findings, and their origins. However, in this line of work, I find myself always discovering new stories. The one I'm discussing today, the Soay Island Sea Monster, is one of those. Soay Island lies on the west coast of Scotland and is best known for being slightly south of Skye, fishing...and sheep. In September of 1959, however, it got a bit more exciting. Tex Geddes, a shark fisherman, and James Gavin, an engineer, had a very strange expereince. Tex and James heard heavy breathing before they actually saw the Soay monster. Upon going to the edge of the book, they saw a dark, and very large, object from their boat. When it moved a bit closer, they got a closer view of a scaly, apparently hump-backed, creature with what they described as a tortoise-lad head, a large mouth, and a serrated back. It is important to note that the accounts of the monster differ slightly between the two men. James had a more moderate approach, claiming the exposed part of the body was somewhere between 6-8 feet, whereas Tex claimed it was closer to 8-10 feet. Tex, humorously, linked it to the head of a donkey in size. The sighting and accompanied story soon gained traction, and was featured innational news media in outlets such as the Illustrated London News. Tex was the main catalyst for this, and wrote about the encounter to prominent zoologist and writer, Maurice Burton. But did they truly seem some kind of primitive sea-dragon, a curiously deformed large animal...or just a sea turtle? Well, writer Darren Naish, who looked into the case, believed it to be the Occam's Razor of answers: a sea turtle. According to Naish, some sea turtles are known for having tall(ish) triangular dorsal structures, beak-like mouths, and long necks. However, he does concede that no sea turtles of the sizes the two men reported have ever been round. So, he admits, there is a chance that it is an unknown species of large marine reptile. The proposed existence of a giant sea-turtle is not impossible. Either way, the story gripped Scotland in the late 1950s and continues to challenge both marine biologists and cryptozoologists today. The above image is a picture of the Sea Caves of Soay and are unrelated to the story (besides, well, the fact that it is an image of Soay) taken by John Allan. It is liscensed under creative commons 2.0. Keith Stewart's discovery raises more questions than it answers. may also raise questions about how deep world famous Loch Ness really is. Loch Ness is considered the UK's second deepest lake at 813 feet deep. However, Stewart has discovered a crevice about 9 miles east of Inverness and he has measured it with state of the art sonar equipment at 889 feet. One of the biggest reasons this is of such importance to the Nessie community is because of the local legends of underwater caves that connect Loch Ness to other lochs, which explains why Nessie has been so elusive. Special thanks to listener Brandon Padgett for suggesting this topic! Picture taken by Flickr user Dave Conner and is licensed under Creative Commons.